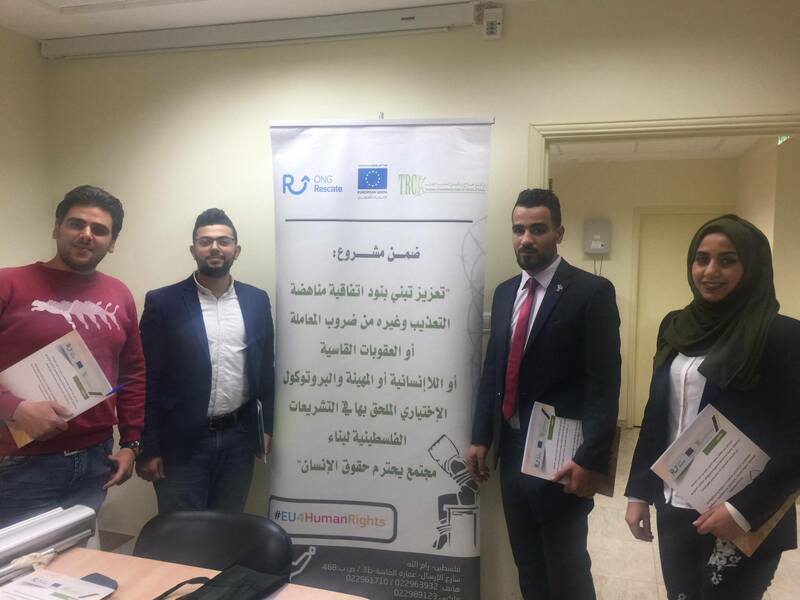 In the 7th of November 2017, the Treatment and Rehabilitation Center for Victims of Torture (“TRC”) organized a workshop under the EU project “Strengthening Support of UNCAT and OPCAT & OPCAT in Palestinian Authority Legislation to Stimulate a Human Rights-Oriented Palestinian Society” (NEAR-TS/2015/26). The event was held in Hebron, at the office of the Defense for Children International (DCI - Palestine) under the title “The crime of Torture in the context of the Palestinian laws and the International law ”. About 22 non-governmental representatives, advocates and human rights activists participated in this workshop. 1. Lecture on the frame work of torture in the Palestinian laws and in International law: this was presented by Amjad Abu Lafi, the Advocacy Coordinator at TRC through PowerPoint slides and was around an hour and a half, including questions and comments from the participants. 2. Groups work: the participants were divided into 2 groups, each group had a brain storming session on several issues in regard of torture including the appropriate punishment for the crime of torture, the shared responsibilities, the application of several legal principles like non-refoulement, non-derogable rights and prosecute of extradite, the group work was about an hour. 3. Representing the conclusions of the groups work: groups had the chance to present the outcome of their brainstorming. later, the participants had the chance to make any questions, then all participants had a joint lunch. Moreover, the event started at 11:00 in the morning and finished at around 1:15 in the evening (before lunch) and a (AL-Wattan TV channel), a local TV channel covered the event. Lastly, we would like to note that each participant was provided with a folder than included a notebook, pen, the agenda (both in Arabic and English), brochure that was designed by TRC in the past months that discusses several issues in regard of torture, and another brochure that addresses most of the controversial articles within the Palestinian laws in regard of torture.